Discussion in 'Build Showcase' started by BasicT, Dec 6, 2018. Hey guys! 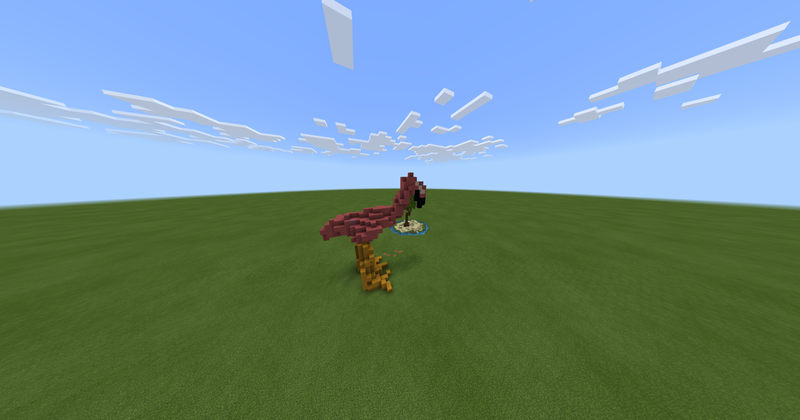 As stated in the title, I will be now be showcasing a flamingo build so you guys can give feedback on my organics. Please note the build will be a little bit smaller as I am now using the Bedrock Edition for now. Other than that, feel free to use constructive criticism and as always, enjoy! Invader Plays and happilycam like this. I think it looks fairly good so far. I have a few pointers, just in case you post of your builds again in the future. Honestly, with just a few tweaks and updates, this would look fantastic. You could always incorporate these into a map as well. - Need a little more up-close of a picture. An Imgur album would be best. That way you can add quite a few different photos. Up-close, birds-eye, etc. I think it would be more beneficial in critiquing your builds. - From what I can see, the foot looks a little flat/large in the picture. Maybe thinning them out and making them a little less prominent would be better. - Try to accentuate the curves of the body. Make it a little fatter as well. It looks a little thin, especially once it forms into the back portion of it. - I can't really see its eyes, but depending on how you want it, maybe just a coal block? Or even a coal block and a piece of wool above/below that. One looks a little more 'kawaii' and one is a little more natural. You could also put a stone button on top of the coal block to add a pupil to the eye. - The island scenery in the back looks perfect. While you can't entirely see the tree, it adds a little to the background. - An interesting tip would be to arch one of the legs like flamingos do when they are drinking or relaxing. Overall, fantastic build. A few tweaks might be necessary to make it even more spectacular. Keep up the good work, and hopefully, you can consider taking some of my tips into mind! firstly I'd just like to say that you've done a good job here, deciding to build a flamingo is definitely creative and not something I would've thought of doing! The lovely @Caameronn has given you some really great suggestions and I agree with pretty much all of what he said. If you're using a reference I'd definitely recommend that you pay attention to all of the little details, the main improvement I would say that needs to be made is the shape - especially focusing on the legs. In proportion to the body they're a bit too big for a Flamingo as they're known for having thin legs. It would also be really cool to see the nice little island that you made enlarged to make more of a scene - the style that you've gone for really compliments the build and theme as a whole. BasicT and happilycam like this. I would do a bigger one use and test around using voxelsniper.